The last time I made a Korma, it went down very well with my sister, so I decided to try again, only using Lamb this time. I modified the recipe a little after reading a few others on the internet, but it's basically the same technique. I also had another go at making Masoor Dahl (Red Lentil Dahl), and although I didn't use Sandra's technique of frying the spices, then adding the lentils and water to that, it did come out a lot better than the previous effort and had a lot more flavour. The main reason I think is because I made a lot less, but used the same amount of spices as last time. 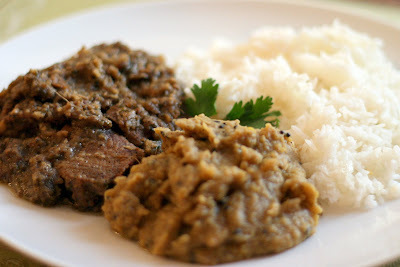 Another reason for the difference with the Dahl could have been that I used Asafoetida for the first time in my cooking. Many Madhur Jaffrey recipes list it as an optional ingredient, however, in the Monisha Bharadwaj book I have, she often lists it as an ingredient and has two pages of the book devoted to it. It wasn't the easiest thing to find, although, I eventually found it in Waitrose, and I have to say, it's got one of the worst smells of anything in my spice drawer. It's kind of sulphurous, perhaps something like the worse pair of trainers worn without socks during a long hot summer. However, once a pinch is dropped into the hot oil, it doesn't smell nearly as bad. Monisha Bharadwaj says that it can make a dish. I'm not sure about that, but the Dahl was good, so I'm going to stick with it in future, although just a pinch. It really doesn't smell like something you should be putting into your food though, although, funnily enough, it's supposed to reduce flatulence among other things! Although the Korma wasn't as hot as I would have liked, it was still pretty nice. I think I probably got the amount of Chili about right, but next time, I will leave the seeds in, or perhaps add a little more Cayenne Pepper. During cooking it really smelled like it was going to be a hot one, but the Coconut Milk really cools it down. The nice thing about both recipes is that they taste just as good, if not better, the next day, and in fact, the photos were taken of my reheated curry lunch as the ones I took on the evening just weren't that great, and I much prefer shooting in daylight. After washing the lentils, put them into a heavy pan along with the Water, Ginger Slices and Turmeric. Bring the pan to a simmer, then cook for an hour and a half, making sure to stir in the last half hour to make sure it doesn't stick. Remove the slices of Ginger. Heat up some oil in another pan and drop in the Pinch of Asafoetida, Cumin Seeds and Mustard Seeds and once they start popping, add in the Ground Coriander and Cayenne Pepper, stir a couple more times, then pour into the Lentils. Finally add Salt to taste, and garnish with Fresh Chopped Coriander. Marinate the Lamb pieces in the Yoghurt, Grated Ginger and Chopped Garlic for a few hours at least (preferably overnight). Put the roughly chopped Onion, Garlic Cloves and Chilies into a blender, blend to a fine paste and set to one side. Heat up the oil in a heavy bottom pan and fry the onion slices for about 5 minutes, until turning golden. Remove from the pan with a slotted spoon and set to one side. Add a little more oil to the pan and add the Cinnamon Stick, Cardamoms, Ground Coriander, Turmeric, Cayenne Pepper and Black Pepper and stir. Now put the lamb and marinade into the pan, stir to ensure they are coated in the spices and cook for about 10 minutes. Next, add the paste and cook for a further 10 minutes. Add a little hot water to help de-glaze the pan a little, and add the Coconut Milk and the fried Onions. Cook for another 30-40 minutes, or until the Lamb is tender. Stir last of the ingredients and serve. After bumping into Mark on Saturday evening he invited me to come and try his Dahl and Lamb Korma at his place. I being a cook myself, was intrigued to try some of his cooking and decided this could be a very satisfying end to the evening! 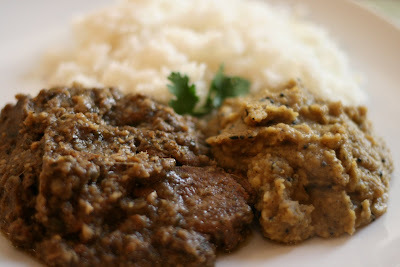 Both dishes were excellent but my favorite was the Lamb Korma, it was so good that i went back for more. It had a rich taste, plenty of flavour, and wasn't really spicy which was a pleasant surprise as sometimes home made curries can be arse burning hot! The Dahl was something I've never tried before but i enjoyed this also. It had a mild taste and a porridge like texture to it. Mark advised me that this was the lentils in the ingredients. I would recommend anybody interested in cooking a curry to try these recipes. Big shout to Mark on this one!